It’s Friesen Friday! Welcome to the first (and easiest) tutorial in the Mixed Media & Polymer Clay Together at Last book by Christi Friesen. This tutorial is fun & super easy. use your imagination and bring your flowers to life. Let’s get started! Christi’s style has an element of realism that many artist’s (myself included) do not have. Make your flowers to reflect you. My flowers are realistic whimsy … be honest, no flower in the world looks like what I’ve created. Use Christi’s book on page 44 & following as a guide. Use this tutorial is a guide. First decide what color you want your flower to be. Grab that color of clay. Or … be like me and make your own marbled blend! Roll your chosen color into a ball (mine is approximately the size of a walnut, about 1/4 a block total). Roll the ball into a log. Using an Exacto knife, divide the log by the number of petals you wish to have. NOTE: In my case I wanted 5 petals … I think flowers look best with 5, 6, 7, or 8 petals. Roll each section into a ball. Roll each ball into a teardrop. Make the stamen simply by repeating many of the steps above. Using your Exacto knife, divide the log by the number of stamen you wish to have. NOTE: In my case I wanted 1 stamen for each petal. Lay your petal onto your work surface. Using your finger, gently “smoosh” or press down. NOTE: To keep fingerprints off your piece, gently dust finger with corn starch. I like the realistic look the fingerprints add by the time I’m done, so I allow them to happen. Lay your gently “smooshed” petals side by side. When you are finished, you should have a flower shape. Reposition your petals as necessary until you get the look you want to achieve. Making a base for your flower is easy. 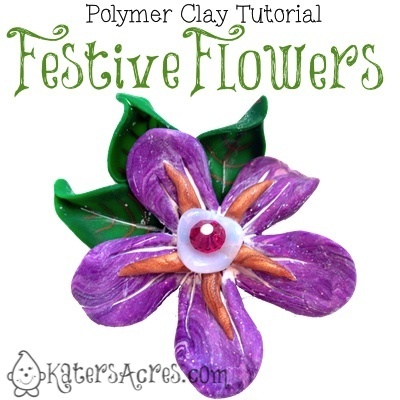 Use a color of clay that matches your flower. Roll it into a ball about the size of a dime. Using a flat acrylic block, flatten your ball. Press down evenly on all sides until desired thickness is achieved. At this point add your signature to your backing piece. Turn your signature so it faces out. Place your flower on top of the disc. Using your sculpting tools, blend the seams of the disc into the petals. NOTE: By doing this step you are adding strength and a “finished look” to your flower. Now it’s time to add your details. Using your ball tool, indent the center of the flower – this is where you will put your bead(s) later. Using sculpting tools, add imprints & gouges to your flowers petals. Use a needle tool to add “scratches” or other definition to your petals. Gently press on the flower petals again to reshape as desired. (Not pictured – oops) Add your stamens that you prepared earlier to the center of the petals. NOTE: I have a whole tutorial on how to properly embed beads … click here to see it! Using whatever beads you have that look “purdy”, add them using the tutorial linked above to your flower. NOTE: I did not have any cool lamp work glass beads and could not get myself to a bead store … so I used what I had, you can do the same. Make sure your flower gets some leaves. You can use this tutorial to make any kind of leaf you choose. You can also use this leaf cane tutorial if you’d like to use leaf canes. NOTE: Still looking for other leaf designs, check this Pinterest search for more ideas. Play with the placement of your leaves. Press firmly to adhere the leaves to the back side of the flower. NOTE: Make sure to give “life” and “movement” to your leaves before adhering them. Finishing your flower is the most important part! Remember to bend, twist, & tweak your petals and leaves before baking! BAKING INSTRUCTIONS: FOLLOW THE DIRECTIONS ON YOUR PACKAGE. This being said, I bake ALL my pieces (mostly Premo! clay) at 265 for an hour each. Sometimes they bake for an hour, twice! I love Christi’s suggestion in her book to help the flower keep it’s movement with a tissue (top left)! Though the flower is beautiful after baking (top right), it is missing something. The bottom left photo shows my flower with my signature after baking. The bottom right photo shows my flower once it has been antiqued – ah! so much better now! Use this tutorial to add a patina to your flower to bring out all those interesting parts you couldn’t see earlier! NOTE: I used an acrylic paint wash of titanium white by combining one part water to one part paint. You can make oodles of flowers that look completely different simply by changing the color, size, number of petals, type of leaves, and so much more! Both of my flowers are completely different. Try making different flowers and see what you can come up with too. i lost my job last year of 20+ years and am trying to find out what i am good at that will pay the bills and i want to tell you thank you from the bottom of my heart for your FREE tutorials. i am very grateful for the knowledge passed on! You are so very welcome Rose. Thank you for joining me, God bless you & your family.